Send a gift of Texas Y'all! Need a great gift item? Gift Klein Bros. to anyone on your list. Send one of our signature barnwood gift boxes, logo boxes or a gift basket filled with unique Texas foods from Klein Bros. After one taste of our products your friends, relatives, or clients will love the exceptional taste and will be asking for more! Check out our variety of gift selections or contact our Customer Service Department for custom design options just right for your gifting need. Klein Bros. is happy to assist you with the perfect, unique, Texas gift. 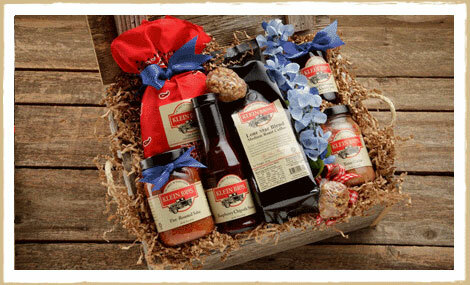 Klein Bros. uses products in all of our gift items that are full-sized product packages. You will never receive or send a gift with smaller "gift package" sampler sizes. We believe in giving the customer the best value in all our gift items. The product sizes you buy from our website or off one of our retailer's shelves is the same size product shipped in our gifts whichever item you select!